ALL-NEW ADVENTURES WITH THE TENTH DOCTOR! Two strangers: the Doctor, charming, eccentric Time Lord with a past as dark and heavy as a black hole; Gabriella Gonzalez, waitress and wannabe artist with a future dragging her down like lead chains. Hurled together by a wave of psychic horror haunting New York, they embark on an epic new adventure across time and space, brought to life by award-winning writer Nick Abadzis (Laika) and fan-favourite artist Elena Casagrande (Suicide Risk)! 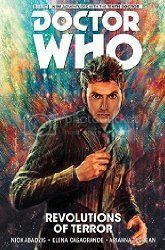 Collects Doctor Who: The Tenth Doctor #1-5. Well, for fans of the Tenth Doctor, this is going to be a pleasant surprise. I wasn't quite sure what to expect going into a comic book adventure for 10, but I've got to tell you, Nick Abadzis captured 10's quirks and characteristics perfectly; his turns of phrases and catchphrases that we're all familiar with are there. I could here David Tennant's voice the entire time. Gabby makes for a decent companion, although I don't know how she would have come across on screen; I think she may have been a little too annoying if acted out, but in the pages of the graphic novel, she works well as a companion for 10. There are two stories collected in this volume. The first, "Revolutions of Terror", about a psychic horror that is infesting New York City, I could easily see working as an episode in the series. The monsters are great, 10 is as clever as always, and Gabriella really steps up and becomes the companion that 10 could use after Donna (this all takes place after the end of Series 4, after episodes "The Stolen Earth" and "Journey's End". The second story, "The Arts in Space", where 10 takes Gabriella on her fist outing in the TARDIS, lands them in an adventure that is told more from her point of view; the Doctor and Gabriella visit an art museum and when the Doctor goes to visit one of his artist friends, they discover that her apprentice thinks that Gabriella is trying to become the new apprentice, and tries to kill them. This story didn't seem to work nearly as well; I know this was to establish Gabriella as a character and to see things from her perspective, but it just didn't click for me. I'll be picking up the subsequent collected editions, as it's nice to see 10 having adventures again. Off to look for the other collections of 9, 11, & 12 now!